World Tourism Day is September 27! Planeta.com hosts a 1-hour conversation via Google+ hangout and will be streamed live on YouTube Thursday, September 25 from 10-11am PDT (1pm Mexico, 6pm London, Friday, September 26 5am Auckland). This year’s World Tourism Day spotlights tourism and community development. We’ll update Planeta.com’s guide to Community Tourism and ask our guests about their experiences around the globe. Community development is of particular interest as it’s hard to see the point of travel if you do not get the opportunity to meet the locals in a way that is mutually beneficial. That said, tourism often has a negative impact and we must find ways now to diminish the damages that irresponsible travel causes. We also need to work toward more practical views of tourism in communities, particularly rural communities. Far too often governments and NGOs alike promote tourism as a motor for economic development without the wherewithal to collaborate with communities over the long-haul. Far too many white elephant visitors centers and unused cabins dot the landscape. Far too many rural tourism officials lack the capacity in simple communication — how many non-functioning websites and emails are out there in 2014 that promote community tourism? What are examples of tourism that benefit communities? How do communities minimize negative impacts of tourism? How can the Web be used to promote responsible travel to rural communities? How can local, regional and national governments, universities, NGOs and media best assist community tourism? What is the difference between community tourism, community-based tourism and community-driven tourism? How do travelers visit a rural community in the rhythm of the community? Bonus points if you share the event via social web channels. Questions for our guests are welcome before and during the hangout. Please share photos of community tourism, rural travel, capacity building and development initiatives in the realm of conscious travel around the world for this year’s celebration. 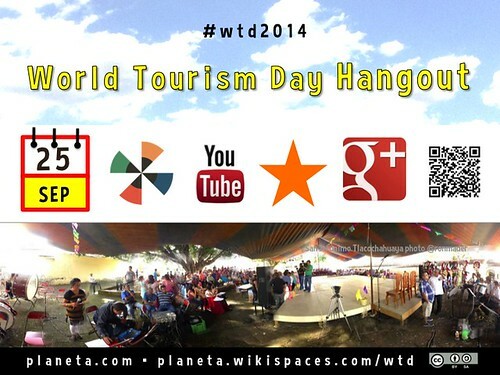 This entry was posted in Announcements, events, Web 2.0 in Action and tagged community, conversation, development, google, hangout, world tourism day, world tourism day 2014, wtd, wtd2014. Bookmark the permalink.